Virtual reality is now within our reach thanks to devices like the impressive Oculus Rift. After years of anticipation, this powerful VR headset was finally released in the first quarter of 2016 and tech fans received it with a lot of enthusiasm. In spite of its high price (the headset alone cost $600 and getting the motion controls adds $200 to the price), the Oculus Rift has made a great impression thanks to the fantastic virtual reality experience that it offers. The price is justified by the advanced technology, compatibility with third-party options, high comfort and a versatile software that lets you experience games and movies like never before. You can also overcome distance and meet your friends in virtual reality, no matter how far away they are in real life. Oculus Rift offers a great selection of games and apps, but up until recently there was no way to backup or migrate this data. Now, thanks to AOMEI’s vrBackupper, it is possible to manage your Oculus Rift data effectively to ensure that it is available whenever you need it. vrBackupper is a practical and easy to use solution to backup your VR game settings including equipment, saved progress, the level you have reached in the game and gold. 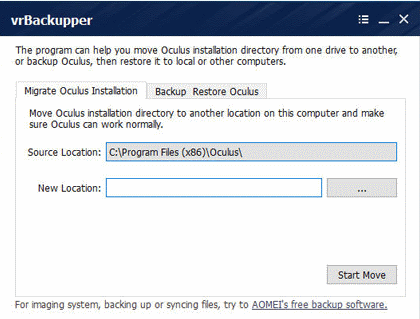 Backing up is crucial for avid gamers that don’t want to loss anything once they restart a game or reinstall Oculus Rift and vrBackupper is the ideal tool to help you with this. AOMEI is recognized for its commitment to quality and innovation, so it doesn’t come as a surprise to know that it is the company that has created the first backup solution for Oculus. With vrBackup, they aim to help players to enjoy the advanced technology that Oculus Rift offers, without worrying about losing their data or not having enough space for installing new games or apps. vrBackup is an easy to use software, you can download it for free and it works with Windows 7 and above. It is a comprehensive and very convenient way to take control over your Oculus Rift data. vrBackupper is easy to install and once it is running, you’ll discover a simple interface that gives you access to all the functions supported. Something that affects Oculus users when it comes to handling data is the fact that it is only possible to store VR games in the installation directory of Oculus. Furthermore, old versions of Oculus can only be installed on system partition. This means that when you try to download new games, you are likely to find out that there is not enough space to complete the installation. vrBackupper takes care of this issue by allowing you to migrate the Oculus installation directory and all its data to another (non-C) drive. Moving your VR games to a different drive will give you back the installation space that you need for new data. Additionally, vrBackupper gives you the possibility of transferring Oculus Rift games to another computer, without having to download them again. If you want to enjoy your games in a more powerful machine, you won’t need to download them again to be able to play them on the new computer. vrBackupper lets you back up the Oculus installation directory from one computer, so you can easily restore the games to another computer. It makes things simple and quick, giving you more time to enjoy your gaming experience. 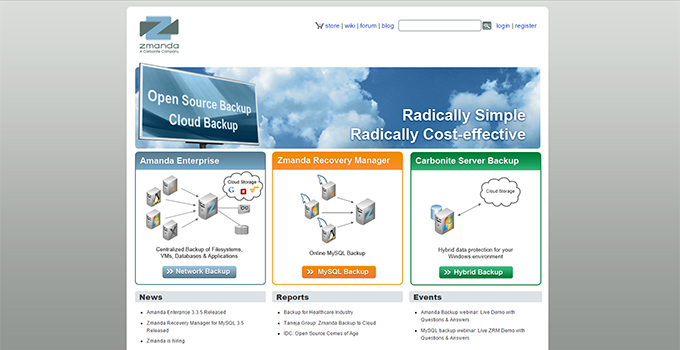 vrBackuppper gives you the possibility of choosing the backup solution that better suits your needs. You can either backup the entire Oculus installation directory, or backup only games and apps. The same goes for restore. If you opt for restoring VR games and apps to a new computer, just make sure that you install Oculus on it first. One of the worst nightmares when you play a game is that your progress is lost after restarting the game, or reinstalling Oculus Rift. All the time and effort that you spent could be gone in an instant, but vrBackupper is there for you, making sure that you don’t lose everything you have achieved within a game. As previously mentioned, it backs up your VR game configurations including your equipment, gold and saved game progress. You will be able to continue the game from where you last saved it. It doesn’t matter if you restore Oculus installation to another machine or move data to a different drive. There is no need to struggle again through difficult levels or defeat the same enemies, you can move on and find out what is the next challenge that awaits you. vrBackupper is a must-have for Rift users looking to backup Oculus games. This practical software allows you to focus on enjoying your VR headset, knowing that your games and apps are safe. 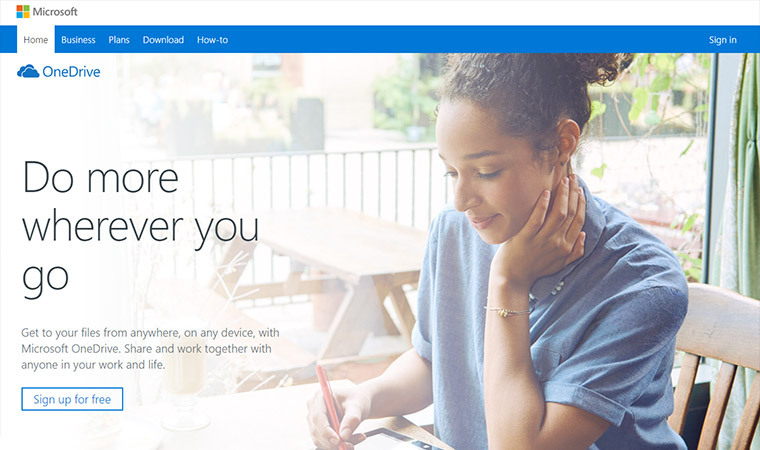 It is easy to use, efficient and will help you to avoid losing your data or your personalized settings. 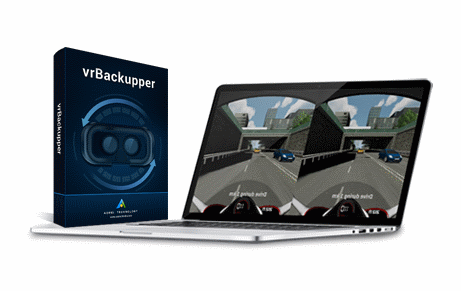 Even if your VR headset breaks, with vrBackuppper you can recover all your games, apps and configurations, and restore them to a new system that supports Oculus Rift. It is also convenient when you need to move your Oculus data to another computer.